” Don’t Lose Your Marbles” is coming to The Great Hall in Parliament Buildings to mark World Mental Health Day. This year AMH will be organising a range of events all over Northern Ireland during the week of World Mental Health Day. AMH will be bringing “The Great Push for Mental Health – Don’t Lose Your Marbles” event to The Great Hall in Stormont on 9th October, 1pm – 1.45pm. 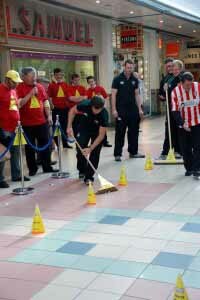 Last year “Don’t Lose Your Marbles” was held in Foyleside Shopping Centre. Various local sport teams, students and the general public took part in the obstacle race. “Don’t Lose Your Marbles” is a fun event in which participants try to steer a number of marbles around an obstacle course using a broom. The object is to try and hold on to all their marbles! Each cone represents one of life’s obstacles such as debt, bereavement, or illness – events which can have a detrimental effect on our mental health. The event is a fun way of celebrating World Mental Health Day and raising awareness of mental health. By being aware of our own mental health, we can build resilience to; and learn to cope better, with what life may throw at us. The event will be opened by the Speaker of the NI Assembly Willie Hay MLA and the compare will be Sue Ramsey MLA, Chair of the Health Committee.